Tests sequencing and learning abilities. Sewing buttons onto prepunched foam picture frames tests sequencing and learning abilities. Assembly of the 3 frame parts provides a simple 3-dimensional problem to solve. 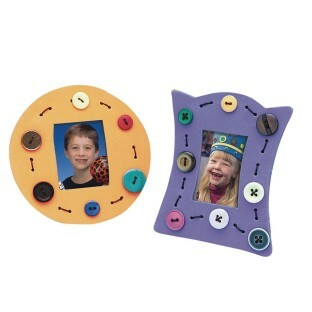 Includes 6 round and 6 rectangular foam frames in assorted colors, cardboard backing and stands, waxed thread, assorted buttons and 6 large-eye metal needles. Glue sold separately. Pack of 12. Level 3.6-4.6.